Manti Te’o may not be the last of the true romantics. The Heisman Trophy runner-up and supposed victim of an on-line girlfriend hoax wrought by an acquaintance stands a distant second in the wine and chocolates line. 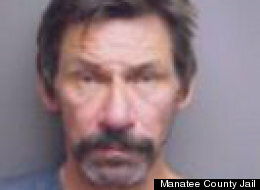 Meet Manatee County (FL)’s own James Flenniken, unpolished thief (allegedly) and dedicated romantic. Beneficiary of an impending date with a lady, Flenniken hopped on over to the local Wal-Mart and helped himself to $80.00 worth of beef steak, wine and beer according to a report in the Bradenton Herald. Nabbed by an alert loss prevention worker, our love struck grifter told police he did the deed to “impress a lady.” The officers –obviously no fans of best-selling author Nora Roberts — were unimpressed and charged Flenniken with petty theft. He was held later without bond in the local hoosegow and thus frustrating any chance at true love. No word on the lucky lady. I’m betting on Winona Ryder. The couple seems to have a lot in common. Did you read rightly? Wasn’t it Strawberry Swill, aged for 6 hours in cow urine in rusty oil barrels? America’s great traditional beverage. The course to true love is littered with obstacles. He will climb any mountain and steal any dinner to impress his lady friend! Strawberry HIll would have been too good for his lady. I am betting on Mad Dog 20/20! did he take a well aged Strawberry Hill wine? I have attached a web site for your information in case you were thinking about stocking up on a couple of cases. The olde “me like, me take” syndrome put on steroids by lub. them boxes of wine is expensive.